A knockoff MacBook charger emits large sparks if short-circuited. Genuine Apple chargers have safety features to protect against this. 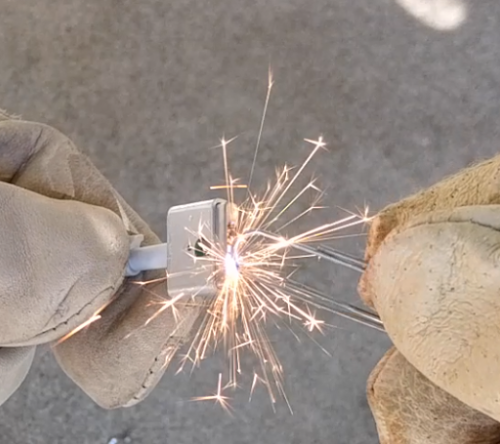 If the connector comes in contact with something metal (a paperclip in this instance), it shorts out, creating a big spark. (Don't try this at home.) 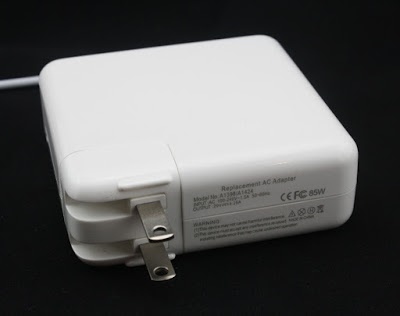 The genuine Apple charger (below) has safety features that protect against a short circuit. Shorting the connector on a genuine charger has no effect. A genuine Apple MacBook charger has safety features that protect it from short circuits. It's really hard to tell a genuine charger from a knockoff from the outside, since the knockoffs look just like the real thing. If you carefully read the text on this charger, you'll notice that "Apple" is missing. However, many knockoff chargers duplicate the text from a real charger, so often you can't tell if it is genuine or not just by looking. Big sparks, however, are a clear sign. A cheap MacBook charger from eBay. Unlike most cheap chargers, this one doesn't claim to be an Apple charger, but just a "Replacement AC Adapter". Why does a fake charger produce sparks, while a genuine one doesn't? The fake charger constantly outputs 20 volts, so if any metal shorts the connector, it produces a big spark with all its 85 watts of power. On the other hand, the genuine charger doesn't power up until it has been securely connected to the laptop for a full second. Until it is properly connected (details), it outputs a tiny amount of power (0.6 volts at 100µA) that can't produce a spark. To manage this, the genuine charger includes a powerful microcontroller (more powerful than the microprocessor in the original Macintosh by some measures). Since this processor increases the cost of the charger, knockoff chargers omit it, even though this makes the charger more dangerous. As the photos below show, the cheap charger (left) omits as much as possible. On the other hand, the genuine Apple charger (right) is crammed full of components. Many of these components filter the power to provide higher-quality power to your laptop. The Apple charger also includes power factor correction, making the charger more efficient. The cheap MacBook charger (left) omits most of the components found in a genuine Apple charger (right). The genuine charger includes more filtering, power factor correction (left), and a powerful microcontroller (board in upper right). I've written in detail before about how chargers work, but I'll give a quick explanation here. The AC power comes in the red wires at the top and is converted to high-voltage DC (170V or 340V, depending on if you're in the US or Europe). A transistor (black component on left) chops the power into high-frequency pulses. The pulses create a changing magnetic field in the flyback transformer (large blue box), generating a high-current, low-voltage output. The output is converted to DC by diodes (black component, upper right), and filtered by capacitors (cylinders), to produce the 20 volt output (wires at bottom). A control IC (see photo below) controls the system to regulate the voltage. This may seem like an excessively complicated way to generate 20 volts, but switching power supplies like this are very compact, lightweight and efficient compared to simpler power supplies. 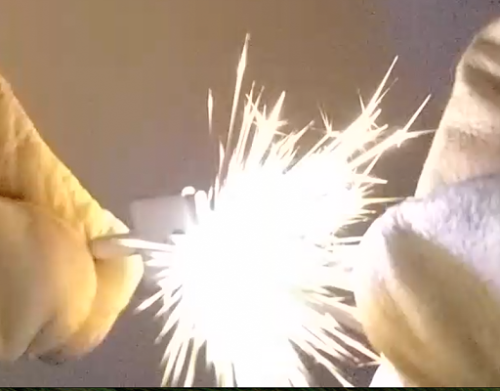 Shorting a cheap charger with a paperclip creates impressive sparks. Looking at the underside of the cheap charger board shows it has very few components, while the genuine Apple charger's board is covered with tiny components. The two chargers are worlds apart as far as complexity, and this complexity is what provides more efficiency, more safety, and better quality power in the Apple charger. The cheap MacBook charger (left) uses very simple circuits compared to the genuine Apple charger (right), which is crammed full of components. While buying a cheap charger saves a lot of money, these chargers omit many safety features and can be hazardous to you and your computer. Don't buy a cheap knockoff charger; if you don't want to pay for a genuine Apple charger, at least buy a charger from a name-brand manufacturer. Maybe you think these safety issues don't matter because you don't poke your charger with a paperclip. But if you have any metal objects on your desk, a random contact could yield a surprisingly large spark. I've written a bunch of articles before about chargers, so if this article seems familiar, you're probably thinking of an earlier article, such as: Counterfeit MacBook charger teardown, Magsafe charger teardown, iPhone charger teardown or iPad charger teardown. Follow me on Twitter to find out about my new articles. If you're interested in the components inside the cheap charger, I have some details. The PWM control IC is a SiFirst 1560, a basic control IC for a flyback converter. The IC datasheet has the approximate schematic for the charger. The switching transistor is a 2N601 2 amp, 600 volt N-channel MOSFET. The voltage reference is an AZ431, similar to the ubiquitous TL431. The optoisolator is an 817C. The output diode is a MBRF20100C 10 amp Schottky diode pair. The electrolytic capacitors are from HKLCON. A cheap charger emits large sparks if you short the connector with a paperclip. Safety features in a genuine charger protect against shorts. How about changing the cable between charger and Magsafe connector to a cheap one and use it on an original charger? I bought a cheap 7$ cable on eBay which looked pretty much the same, soldered it in place and glued the case back. But when I was going to measure the voltage on the tips I got a spark. Turns out the magnetic bit wasn't grounded like in the original cable. I don't know what happened but the probes must have touched something that it shouldn't have. So sparks can happen even with original chargers but fake cables. Maybe if they hadn't created such a silly connector design, it wouldn't take $50 worth of electronics to prevent common household objects from shorting it out.